Facebook ads don’t win elections. In fact, I think setting a pile of donor money on fire might be just as effective. But in your 2018 Polk County School Board races, they do provide a fascinating glimpse into the convoluted politics of public education — which is simultaneously a state, local, and federal issue. 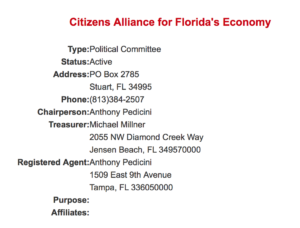 In sum, a political committee called “Citizens Alliance for Florida’s Economy” (henceforth known as CAFE) is funding Facebook ads attacking Jennifer Sabin and Sarah Fortney as vaguely threatening boogeywomen. No actual policy critiques. Just spooky vibes and they’ll eat your children type stuff. It’s Halloween after all. I’m not going to link because I have no interest in helping goose the metrics that pay whoever created them. It’s a reasonable bet that person is somebody named Anthony Pedicini. He is the “registered agent” and “chairman” for CAFE. See below. He’s also a political operative for House Speaker Richard Corcoran, among many other folks. 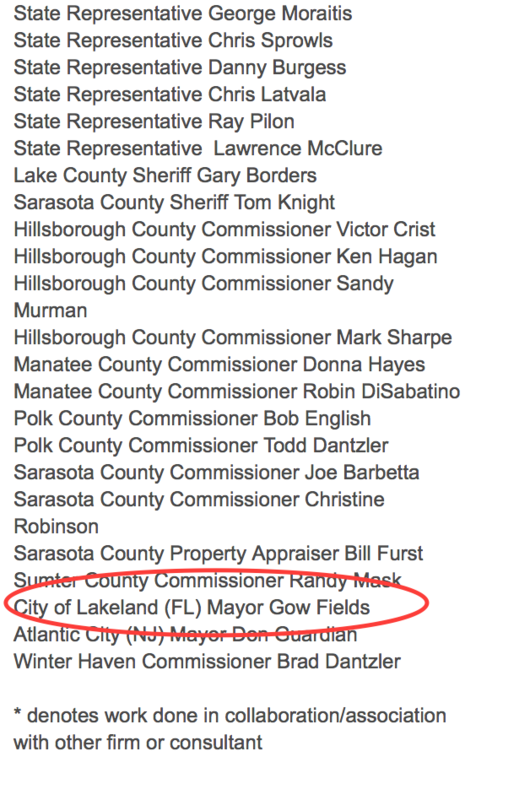 And his firm has worked on a bunch of local campaigns over the years, including one for Gow Fields at some point. More on that in a second. First, it’s important to note that CAFE is really just a gargantuan pyre of money waiting to be burned on annoying electioneering. Since 2014, it has raised almost $6 million for mayhem. In the 2018 cycle alone, it’s raised hundreds of thousands of dollars. Here’s a screen shot from just one recent $95,000, four-day fundraising period: 10/22 – 10/26. Click to zoom. I particularly like the $35,000 from “Auto Glass America” of Scottsdale, Arizona. No, I haven’t the foggiest. Apparently, Sarah Fortney and Jennifer Sabin present a mortal threat to something vital to the glass industry in Arizona. I jest. But Sarah and Jennifer — indeed the entire Polk County awakening to the realities of test-and-punish, anti-teacher education — do pose a mortal threat to how education leaders have led for a generation. They pose a real threat to the soulless, nihilistic political leadership machine that CAFE and its mercenaries represent. That is what’s motivating CAFE. Trust me. Not one dollar anywhere on that fundraising report cares an iota about you or your child — no matter which party or creed or ideology you subscribe to. Pedicini and a guy named Thomas Piccolo make up a thing called “Strategic Image Management.” It seems to be a political consultancy. And they’ve got quite the client list. Richard Corcoran, who sources say would likely become Ron DeSantis’ Education Commissioner, sits near the top. 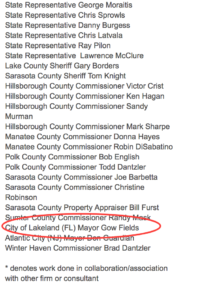 You will also see a giant swath of the Polk County Political Leadership class of the last generation. See the client list below. It includes Gow Fields. Click to enlarge. It’s been a while since Gow has run in or won a campaign. So I don’t know specifically what this refers to. Kay Fields, of course, is married to Gow Fields. She is the 16-year-incumbent that Jennifer Sabin is seeking to replace in the District 3 School Board race. People can draw their own conclusions about any connections. For the record, I don’t think Scott Jones has any connection to the ads Pedicini’s group is running against Sarah Fortney. Everything I’ve seen indicates that Sarah and Scott have run a model campaign, much like Lisa Miller and David Byrd did. I like and respect them both. But this link explains why I strongly believe Sarah Fortney is the right choice. And this link explains why I strongly support Jennifer. What’s really fascinating about that list is that there are no school board members on it. Pedicini hasn’t played in this space before, apparently. The fact that Pedicini is now choosing to light on fire some of his donors’ millions in a Polk School Board race shows what transformative candidates Sarah and Jennifer really are. It’s the sincerest form of flattery. What’s going on in Polk County is important — and people as far away as Scottsdale, Arizona know it. It’s also a sober reminder of what “we the people” are up against in trying to choose our leaders intelligently. It’s not easy. And people like Anthony Pedicini have a big interest in keeping it difficult.